In an unusual move, drug traffickers are said to have boarded the ship anchored near the Santos port and than 1.3 tons of cocaine on the vessel, headed towards Europe. RIO DE JANEIRO, BRAZIL – Federal Police in Brazil along with the country’s Naval Patrol Group have uncovered a very unusual way for drug traffickers to transport their drugs to the European continent from the Port of Santos in the state of São Paulo. More than 1.3 tons of cocaine were apprehended at the Santos Port, photo internet reproduction. A distress signal from an Italian carrier on Sunday night led police to uncover more than 1,322 tons of cocaine hidden in containers headed for the port of Antwerp, Belgium. 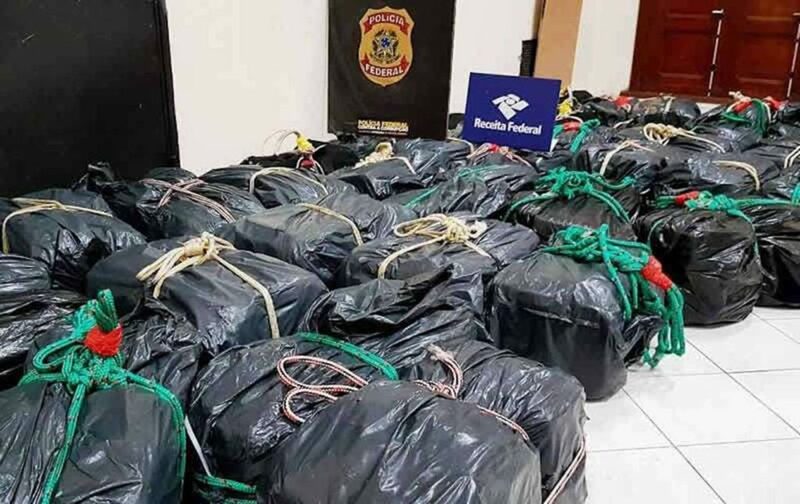 According to the ship’s commander, modern-day pirates climbed aboard the ship during the night and placed more than 41 large bags containing the drug into two containers carrying bags of peanuts. The vessel, the Grande Francia, was waiting to dock, anchored fifteen kilometers from the terminals. “When he realized the situation, the commander hit the panic alarm and locked the gangway, which alerted the other crew members, who locked themselves in where they were,” explained Federal Police deputy, Luciana Fuschini to online news site G1. According to Fuschini, the ‘pirates’ remained on the ship for approximately two hours, where it is believed that they hoisted the bags containing ‘bricks’ cocaine from a small aluminum boat into the bigger vessel and hid them in the two containers. Despite the distress signal, Brazilian authorities did not venture out that night. The choppy sea and 2.5-meter waves prevented authorities from getting close to the vessel until the early morning hours of Monday. By then, the trespassers had already left the ship. Now Brazil’s Federal Police is investigating whether or not the shipment of cocaine was hoisted by the gang during the invasion of the ship and if some of the crew was involved in the smuggling operation.